The spacecraft for the SORCE mission was provided by Orbital Sciences Corporation. It was tailored to accommodate SORCE mission requirements and the SORCE instruments. The bus module of the spacecraft provides all of the on-orbit support required for the instrument suite to obtain the mission science data and transmit it to the ground for processing and distribution. 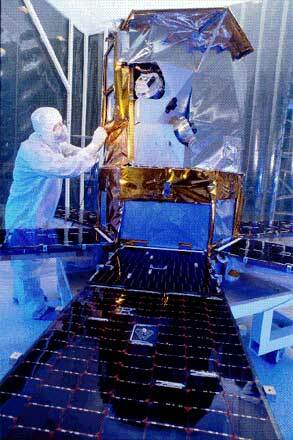 The bus and the instrument module (IM) were developed and integrated separately at Orbital and LASP facilities prior to their system level integration and environmental testing. The SORCE satellite bus was based on Orbital’s LEOStar-2 (TM) satellite platform and was customized to meet SORCE mission specific requirements. Engineers and scientists from NASA, LASP, and Orbital worked together throughout the design phase to optimize the hardware components and to maximize performance and reliability. The satellite structure is a robust, hexagonal modular unit. SORCE satellite in Earth Orbit. S-Band communications, compatible with NASA’s ground net-work. The spacecraft provides radio communications for space-to-ground and space-to-space interfaces. The subsystem uses dual transceivers and a pair of omni-directional antennas and is completely redundant. SORCE is compatible with the NASA Space/Ground Network and the TDRSS system, which is especially important during early orbit checkout. The SORCE Command and Data Handling (C&DH) subsystem control all aspects of the bus operations. Commands from the ground are received within the C&DH system by way of the radio frequency (RF) subsystem, and acted upon by the spacecraft computer, or passed directly to the IM microprocessor for instrument operations. Data collected during the spacecraft operations are stored and processed through the RF subsystem back to the ground. The SORCE satellite bus uses both off-the-shelf components that are manufactured around the world as well as customized components developed in Orbital’s manufacturing facility. 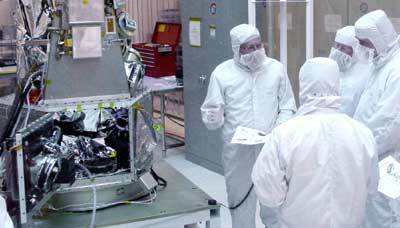 The spacecraft is integrated and tested for the rigors of space flight in Orbital’s cleanroom and environmental test facility in Dulles, Virginia. SORCE takes advantage of Orbital’s proven methodologies that ensure rapid development and delivery of a highly reliable spacecraft. SORCE is a manifestation of Orbital’s 20-year experience in the design, manufacture, and launch of quality satellites. The SORCE power system generates, stores, and distributes electrical power to the spacecraft bus and the science instruments payload. The spacecraft generates its own electrical power through strings of high efficiency solar cells that convert sunlight into electrical power. In sunlight, the solar array delivers sufficient power to recharge the battery in preparation for the next eclipse period. 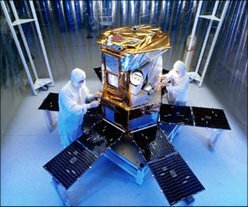 Below are pictures of the SORCE satellite being assembled in Orbital’s Clean Room in Dulles, Virginia.